I've been shopping online since 2012. Back then, my transactions were solely for buy and sell purposes and I paid through a debit card, EON from Unionbank in particular. I didn't worry much since I only added funds to the card with the exact amount of money I needed to pay for certain items and used it right away after loading the card. So in the event that the card details are somewhat intercepted over the web, there is nothing left to spend. But I didn't renew the EON card after it expired as I have been banking through other banks already. All online purchased since then were paid using a credit card connected to one of those banks (BPI in particular). Although there was a potential danger that the CC details may be used without permission despite careful usage, I've never had any issues with unauthorized fraudulent online use of the actual card. I've never even heard about the BPI eCredit until one day, we received one through a BPI registered mail. Of course, we verified it through the 89-100 hotline and confirmed that it was indeed BPI which sent the card after their system noticed our consistent online payment transactions (through another payment portal connected to the card). So that was a pleasant surprise. I've never been worried with web related financial transactions ever since (well, there's still a bit of worry left). So when I finally received a CC under my name (no longer a supplementary holder but a primary now), I ordered for this free BPI eCredit card right away. The card is free to use; there is no annual fee. You can also set a limit (which is often lower than the actual CC), so in case the card is compromised over the web, users cannot make a purchase beyond the chosen limit. You should also call the hotline right away and report any problem so the card is immediately prevented from being used without your permission. 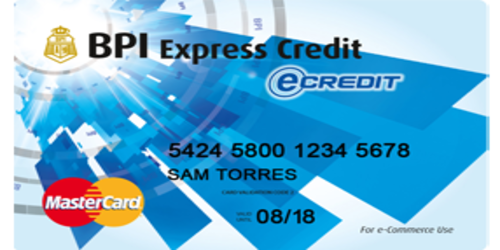 For more information on the BPI eCredit card, see this page and click on the corresponding card > http://www.bpicards.com/Cards/Details/8 .